1. Put the flour into a food processor, add the butter and whizz until the mixture resembles breadcrumbs. Add 100g of the icing sugar, the egg yolks and vanilla and blend again to make a smooth dough. Wrap in cling film and chill for at least 1 hour. 2. Preheat the oven to 190ºC, gas mark 5. Line 2 baking sheets with baking parchment. Roll out the dough to a 5mm thickness on a lightly floured surface. 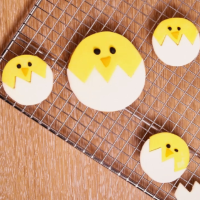 Using a 8cm round cookie cutter, stamp out rounds and space slightly apart on the baking sheets. Re-roll the trimmings and cut out more cookies to make around 24 in total. 3. Bake for about 10-12 minutes until pale golden around the edges. Leave for 2 minutes then transfer to a wire rack to cool. 4. Lightly dust a work surface with icing sugar and thinly roll out the yellow icing then using the same cutter, stamp out 12 circles. Repeat with the white icing. 5. Dust one yellow circle with icing sugar before placing one white circle on top. Using a sharp knife cut a zig zag across the centre. The result will be two white halves (the eggs) and two yellow halves (the chicks). 6. Stir together the remaining 50g icing sugar and 2-3 tsp water to make a smooth, brushable icing. Brush the cooled cookies with icing and lay one of the white halves on the bottom half of the biscuit, lining up the edges. Take a yellow half and match up the cut edges with the white half as you lay it onto the biscuit. 7. Using a tiny amount of the icing as a ‘glue’ add small balls of black icing for the chicks eyes and a small triangle of icing for the chicks beak. Repeat until all the biscuits are complete.